Indigenous woman store owner Octovalo, Ecuador: Ecuador: Travel photography from around the world, including Cuba, Ecuador, Egypt, Germany, Greece, Guatemala, India, Italy, Japan, Mexico, Morroco, Paraguay, Siberia, Taiwan, Tanzania, and the United States. An indigenous female store owner stands in the doorway of her store across from the central market in Octovalo, Ecuador. 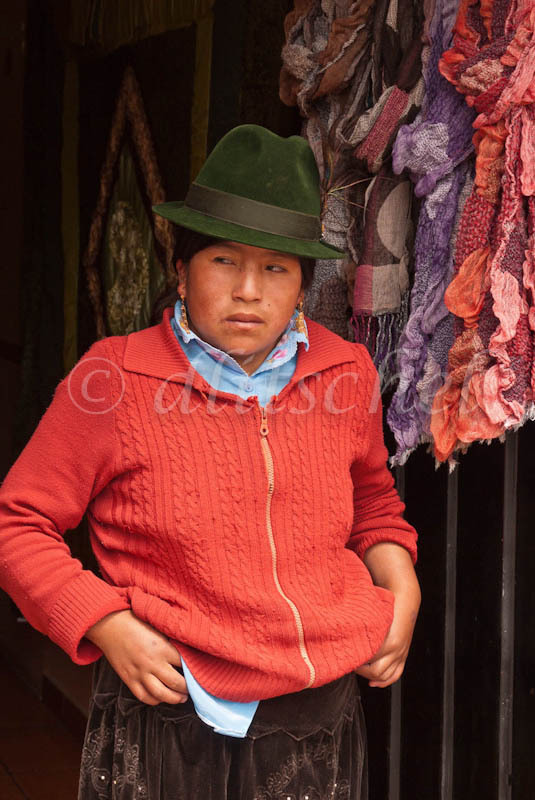 She is dressed traditional clothing including a "fedora" type hat, worn by women of the region. She is looking to the side.